If you aren’t the lucky winner, don’t sweat it, you can still get your hands on DDL from their webshop at ShopDenimDesignLab.com. 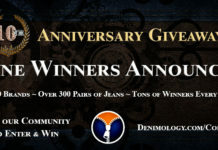 Please note that by entering this competition you are agreeing to receive email newsletters from both Denimology and Denim Design Lab. Only one entry per email address will be accepted and the closing date for entries is May 31st, 2010.